It often seems today that no dispute is barred from resolution by arbitration. Even the fundamental question of whether a dispute falls under the exclusive jurisdiction of a judicial body may itself be arbitrable. Arbitrability is thus an elusive concept; yet a systematic study of it, as this book shows, yields innumerable guidelines and insights that are of substantial value to arbitral practice. Although the book takes the form of a collection of essays, it is designed as a comprehensive commentary on practical issues that emerge from the idea of arbitrability. Fifteen leading academics and practitioners from Europe and the United States each explore different facets of arbitrability always with a perspective open to international developments and comparative evaluation of standards. This book has its origins in an International Conference on Arbitrability held at Athens in September 2005. Seven papers presented there are here reviewed and updated, and nine others are added. The subject of the book – arbitrability – is one that is much talked about, but seldom if ever given the in-depth treatment presented here. Arbitrators and other practitioners in the field will welcome the way the analysis moves logically from theory to practice regarding every issue, and academics will recognize a definitive treatment of arbitrability as understood and applied in the settlement of disputes today. Foreword. Table of Abbreviations. Part One: Fundamental Observations and Applicable Law. 1. Arbitrability – International and Comparative Perspectives: Is Arbitrability a National or an International Law Issue? L. A. Mistelis. 2. On Arbitrability: Persisting Misconceptions and New Areas of Concern; S. L. Brekoulakis. 3. The Death of Inarbitrability; K. Youssef. 4. The United States’ Perspective on ‘Arbitrability’; L. Shore. 5. General Remarks on Arbitrability under the New York Convention; D. Di Pietro. 6. Law Applicable to Arbitrability: Revisiting the Revisited Lex Fori; S. L. Brekoulakis. 7. On Arbitrability: The Arbitrator as a Problem Solver; H. Pamboukis. Part Two: Substantive Rules on Arbitrability. 8. Liberal Rules of Arbitrability and the Autonomy of Labour Arbitration in the United States; T.E. Carbonneau. 9. Insolvency and Arbitrability; C. Liebscher. 10. 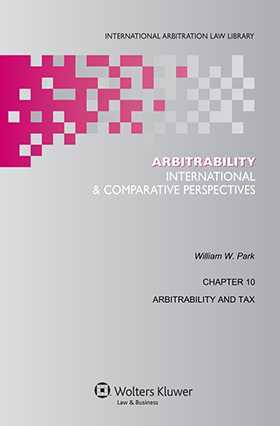 Arbitrability and Tax; W.W. Park. 11. Arbitration and Criminal Law: Jurisdiction, Arbitrability and Duties of the Arbitral Tribunal; A. Mourre. 12. Competition Laws: Limits to Arbitrators’ Authority; J.D.M. Lew QC. 13. Arbitrability and Intellectual Property Disputes; A.P. Mantakou. 14. Arbitrability of (Intra-) Corporate Disputes; M. del Pilar Perales Viscasillas. 15. Arbitrability in Finance and Banking; I. Bantekas. 16. The ‘Arbitrability’ of Disputes Arising from Commercial Representation; S. Kröll. Table of Cases. Table of Awards. Subject Index.